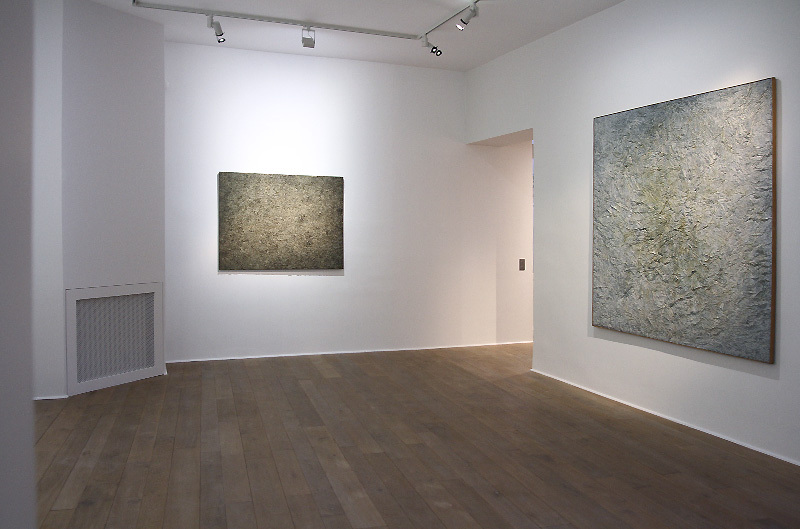 The french gallery Guttklein Fine Art brings together some major pieces of Jean Dubuffet, Antoni Tapiès, Simon Hantai, Martin Barré, Marc Devade, James Bishop and Kenneth Noland in an exhibition called « De la peinture, 1960-1980 ». 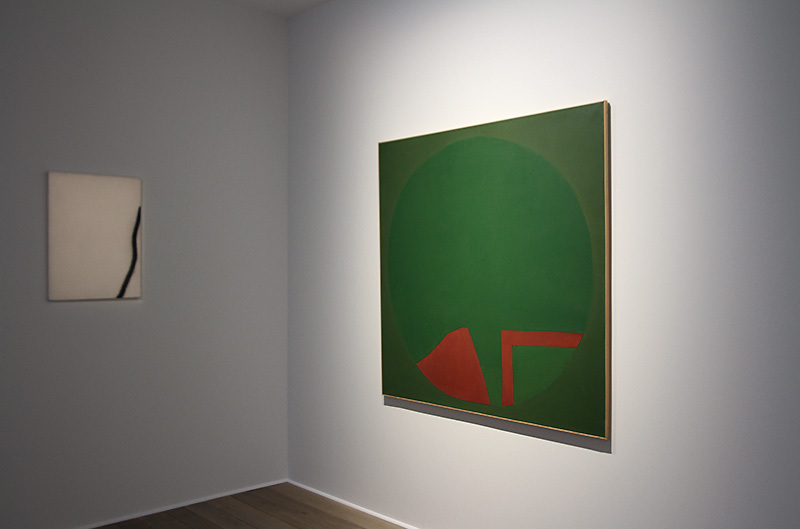 Through the work of those significant artists, the purpose of this exhibition is to highlight three forms of exploration and innovation of minimal and abstract painting of the 1960’s and 1970’s. 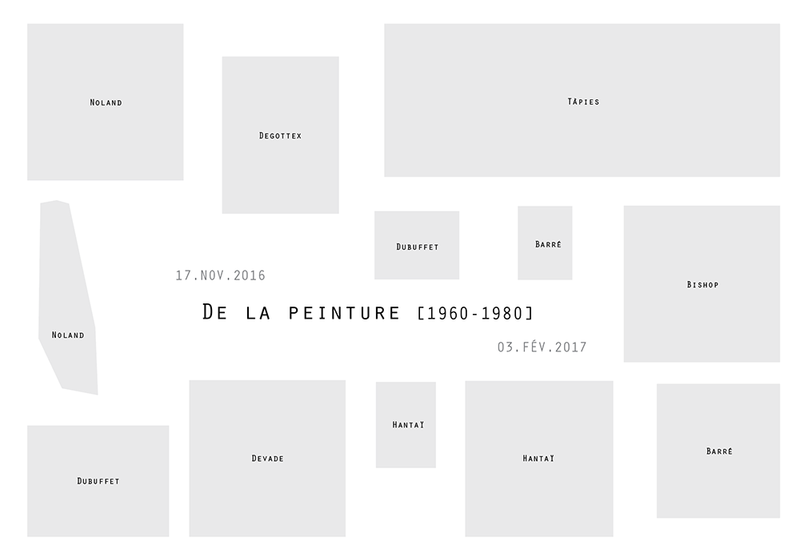 The exhibition « De la peinture, 1960-1980 » is divided into three different sections. 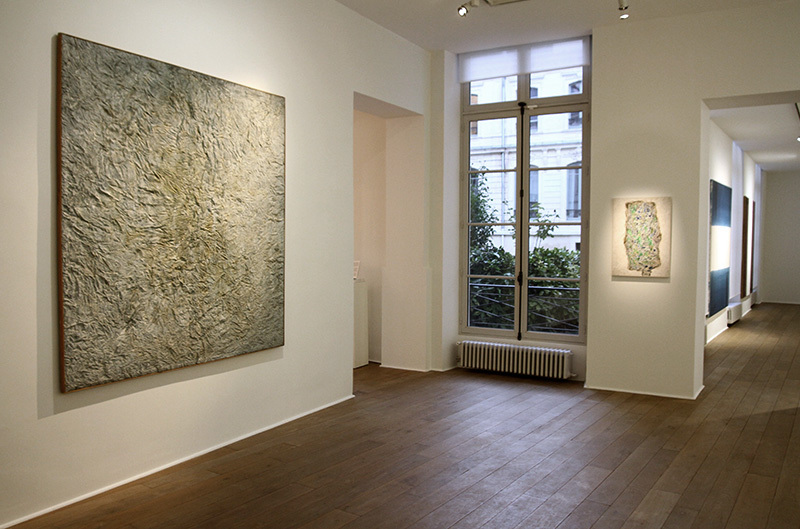 Entitled « Surface-Texture », the first section gathers Jean Dubuffet’s Tapis aliment and the Triptyque avec terre, a monumental piece by Antoni Tapiès. Both of Dubuffet and Tapiès explore the same theme but in many different ways. The first creates volume with acrylic, making some kind of a painting-sculpture, while the second projects raw material directly on his empty canvas. 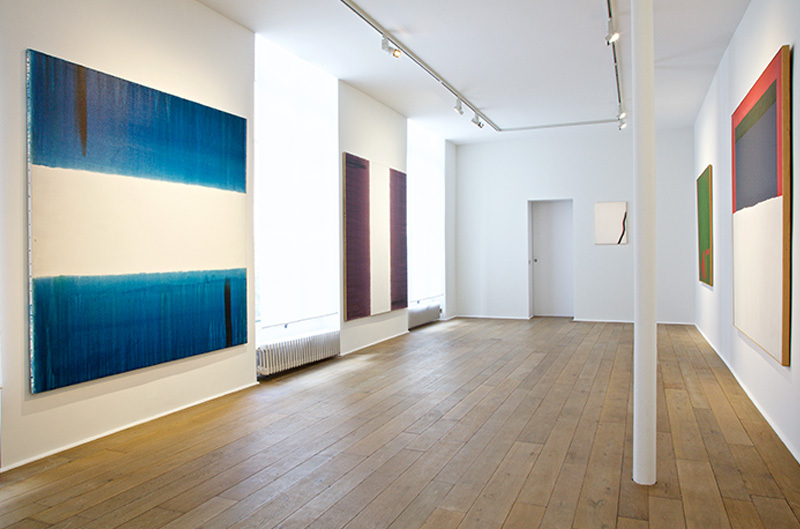 Second chapter of the exhibition, « Pliage/Bombage » presents the duet Simon Hantai and Martin Barré. Those two artists revealed their creative genius by inventing completely new ways of painting. Prefiguring street art, Martin Barré was the first using spray paint with an artistic intent. With this technic, he removes the brush and thus imposes a distance between the artist and his work of art. Simon Hantai does the exact opposite, inventing the method of Pliage. To realizes his emblematic series of Mariales, the painter puts the canvas on the ground, folding it, unfolding it, walking through it. With Simon Hantai, the canvas is not only a projection screen but becomes a real part of the final piece. 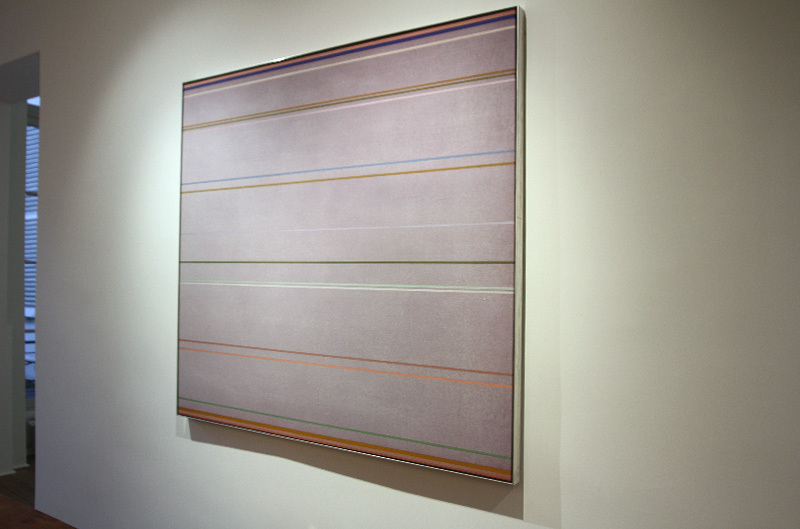 Last section, «Fond-Couleur» compiles works of art of Marc Devade and the americans James Bishop and Kenneth Noland. With these tree artists, abstract painting simultaneously reaches its zenith and its end. Starting with threw Colorfield Painting to achieve minimalist work of art. Paintings with no subject; patterns which tend to disappear; only color and light truly matter. In other words, once freed from the mimesis, painting becomes its own object and its own purpose. Tapiès, Dubuffet, Hantai, Barré, Noland, Bishop and Devade. Seven major figures in abstract art, all struggling against the Ecole de Paris. Seven artists who constantly questioned and challenged their own practice.